This entry was posted on Monday, September 26th, 2011 at 06:56 and is filed under Media, Politics, Sarah Palin. One of the constant smears leveled at Sarah Palin is that she “quit” her office as Governor of Alaska. The word “quit” is used in the form of a smear, in order to paint her as less-than-committed, but the truth of the matter is that in resigning her post, what she actually did was a magnificently honorable act, rarely done in politics. How many times have you wondered if Barack Obama shouldn’t simply do the honorable thing in the name of the country, and step aside? The problem is that would still leave you with President Joe Biden, so it would not offer much relief. More importantly, however, we must consider the nature of the alleged “quitting” and why Governor Palin left her office early. She wasn’t hounded from office, or anything of the sort, except that what tore at her was the fact that each day she remained, costs were being inflicted on the people of her state, counted in all the wasted dollars spent handling the various FOIA requests, and all the bottled-up legislative work that hung in the balance. Governor Palin could have stuck it out, but what would have been the cost to the State and the People of Alaska? We’ve had numerous politicians under fire for actual wrong-doing who wouldn’t resign, relying upon tax-payers to bear the costs of their defense. In truth, it is the willingness of our current president to see your money wasted while trying to stave off investigations into his conduct and the conduct of his administration in a number of issues that permits him the luxury of avoiding the “quitter” label. Visitors logs? Fast and Furious? Solyndra? The list goes on and on, but measuring his character, we now know he will never yield the office, no matter how badly he’s run it, and no matter how much it costs the people of America to sustain him in it. Even as some members of his party now murmur that he should indeed “quit” in the interests of his own party by refusing his renomination, Obama stubbornly rejects such suggestions on the basis that his personal claim to official power supersedes the interests of his party, the tax-payers, the voters, and frankly anybody else who gets in his way. Contrast this with the facts of Governor Palin’s resignation. She had already said, some years before, that she would rather quit the office than ever let the people of Alaska suffer needlessly for her sake. Many politicians make such oaths, but few ever live up to them. 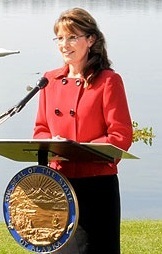 After her Vice Presidential run in 2008, she returned home to Alaska to find that the war against her from the national stage had been moved to a field of battle in Alaska. The war against her raged on, with a single purpose: Her adversaries had seen her powerful potential on the national stage, and this was a preemptive strike against her, with the ultimate purpose of the attack being to destroy her, that she could never return to do battle against the machine in Washington DC. If the people and the state of Alaska needed to be ruined in the process, they considered it as mere collateral damage in a necessary campaign. Some will insist on gaining the political advantage of using the term “quitter” for its negative connotations. This is to tell a lie, and further a smear, and while some are only too happy to do so, I believe in justice, so let me tell you what this really had been: Governor Palin possessed the strength of character to act in the best interest of her state and its people despite the costs to her own short-run political power. She must have known when she resigned her office that she would be called a “quitter.” She must have known how this would be used against her in any future political endeavor. What she did was to put her faith in the good sense of the American people to recognize the truth. She always believed in the values and wisdom of the American people to ultimately sort out what was real and what was merely another political falsehood. In my favorite book, Atlas Shrugged, the protagonist is John Galt. His act of “quitting” and all those who followed him was portrayed by the villains as an act of abandonment and cowardice. One after the other, all the best and most virtuous people “quit” and disappeared, leaving behind all the trappings of fame and fortune for the sake of an idea, knowing that by the rules they had been fighting, they could never succeed or win. Instead, they “quit.” In so doing, they rescued the world, because without them, upon whom the villains had relied to keep the world going, evil was starved out of power. As they quit, they joined in an effort to undermine the broken, evil system from the outside in a way they could have never accomplished from within. In isolation, what they found is that their power had been magnified by their absence. Is Governor Palin’s position now any different? The great shellacking of the left in 2010 was largely a result of the determined efforts of Sarah Palin and all those Tea Party patriots who answered her clarion call to clean up Washington by sending in new blood. The Tea Party responded magnificently, and they began in earnest the process of that critical reform. In this way, Sarah Palin has been a far more effective leader for the nation than she could have been in her office of Governor. What she must have discovered is what John Galt knew: In walking away, you will find liberation if you have the wisdom to make use of it. At the end of the story, there comes a moment when the so-called “quitters” realize the way has been made clear, and they decide to return to the world at large. I can only imagine that Sarah Palin now looks to see if her way is now clear, and whether there is an opening through which she may now re-emerge. I believe that evidence has come in several forms, including the results of 2010’s elections, and the progression of this electoral season. At this moment, the Republican field is being shown to have few shining lights. Herman Cain’s ascension to the top of the Florida GOP straw poll is just the latest example. What all of this demonstrates is that the Emperors have no clothes. The people we’ve been told are the “front-runners” have been such only for the apparent lack of better choices. There is a vacuum into which others may attempt to leap, but in truth, we all know that there’s only one person who will satisfy this lacking, and it isn’t the governor of a very blue state. Those who suggest Palin had “quit” understand little about her governing philosophy. She had always believed that no single personality is more important than the business of responsible governance. When she resigned her office, it was in recognition of this fact and obedience to her conscience on the matter. Most politicians will fight on because to hold power is the end-all, be-all of their existence. Their egos come before all else, and the narcissism implicit in their behavior drives their decision-making. It is always all about them. Governor Palin is not that kind of leader, and her resignation was the indisputable proof. She thought it better to stand aside, or as she put it, “to pass the ball.” You may be forgiven if you have bought the superficial narrative about “quitting,” but it’s time to accept the truth of this story: What she did, she did out of her firm commitment to Alaska and Alaskans. Many Americans claim to want leaders who exhibit the strength of character to put the interests of the country before their own political careers. Governor Palin made precisely that choice, to her own political detriment, but to the immediate benefit of the people of her state. “Passing the ball” to Sean Parnell, the media circus and the political smear campaign followed her, leaving her successor to run with the ball unobstructed on behalf of the people of Alaska. Knowing this now lays the question upon your intellectual table: Did you mean it when you said you prefer your leaders to put the interests of the people ahead of their own, or was that mere posturing on your part? Politician after politician makes this sort of promise, but damnably few of them live it. What of you? When you lamented the state of politics and the general moral bankruptcy of so many politicians, did you mean it? Did you understand what you were asking of them? Having watched politics for so many tiresome years being played out with always the same essential ending, have you become too cynical to recognize that in the person of Sarah Palin, there had finally been a politician who had actually lived according to that premise which is for so many just more high-minded talk never to be followed by actions? I long ago decided that Sarah Palin was anything but a “quitter.” I realized it was just one more example in a long string of smears, where virtues are twisted into vices. In much the same way that my favorite heroes in literature had their best and highest virtues turned upon them, so it is true of Sarah Palin. I recognize in her a politician who did not abandon her oath, but instead, in the most thoroughly rational and honorable way, she kept true faith and allegiance to it. What her example should actually teach us is how lacking in honest virtue our current leadership in Washington DC has been, as they fight to maintain their power without any concern for how it hampers the nation and its people. Instead, they cling to power like so many ticks to the hound, embedded and draining the lifeblood of the nation. As a group, they could exercise no greater virtue than to “quit,” but don’t expect that spectacle any time soon. The vice that is their compulsive grasping for power forbids it, and all the while, the nation suffers mightily at the hands of their intransigent incompetence. There is great virtue to be found in that rarest of politicians who puts the interests of the whole people ahead of her own, but for a change, and in justice to all our finest declarations about the virtues we wish to see in our leaders, we should recognize it and honor it. Sarah Palin isn’t a “quitter.” She kept her word. Mark, it appears that someone passed you the ball and then you hit it right out of the ball park…I absolutely enjoyed reading this blog! Thank you Mark for this excellent explanation. I have tried to explain it to those whose only comment when I say I like/love Sarah Palin is "she's a quitter". Thank you for giving me this tool! I have emailed to my list and liking it on Facebook! God Bless you! You are right about our characterization of the "quitting" matter. Gov. Palin as nominee candidate will need to hit this question out of the park, which I'm certain she will. I don't recall you mentioning the financial costs of fighting these frivolous lawsuits: an estimated $500,000 from Palin's personal savings and $300,00 from the State of Alaska. In the end, there are three types of individuals who pose this supposed problem for Palin: (1) those who are die-hard detractors who would never vote for Sarah, (2) those who are open minded and receptive to hearing the facts, and (3) supporters, like you and I, who don't need to be convinced to support Gov. Palin. It is important to identify and focus on that second (2) group. I was there when all the press and the Alaska blogs went out of their way to find anything ,something to try and pin on her..the fear was palpable with these people..they are the word twisters and all of them were seeking prey to make their lives mean something. It was like they all fed off of each other…they forgot that Sarah has never gone about unarmed..God is with her. everyone has "quit" something. A job, relationship etc. Obama quit and he never even got started so he and his messianic followers are the LAST ones to call someone a "quitter" in a negative way. Mark, I will never be as eloquent as you, but I respect the story you wrote very much. I feel it will open the eyes of a lot of "HATERS", and maybe they will learn from it. Who was it that said, " If the doors to perception were cleansed, everything would appear to them infinite. For they have closed themselves up so much they can see only through the chinks of their cave". I hope you don't mind if I send your story to friends and family. Fred, you may indeed! Thank you!